It is that time of the year again; when the ‘City of Joy’, Kolkata, becomes a Puja madhouse with the thumping beats of the Dhaks (huge membranophone instrument), exquisite Puja Pandals (fabricated structures), blazing lights, quintessential food, mesmerizing dhunachi (incense burner used for one of the stages during Aarti) dance, all of it, drenched in a devotional fervor of the homecoming Goddess DURGA. Millions of people in stiff new clothes, flock up in the jam packed streets of the city, enthusiastically shoving their way to get glimpses of the divine Goddess. The cheerful crowd goes hopping from one pandal to the other, each pandal gaudier than the previous one. 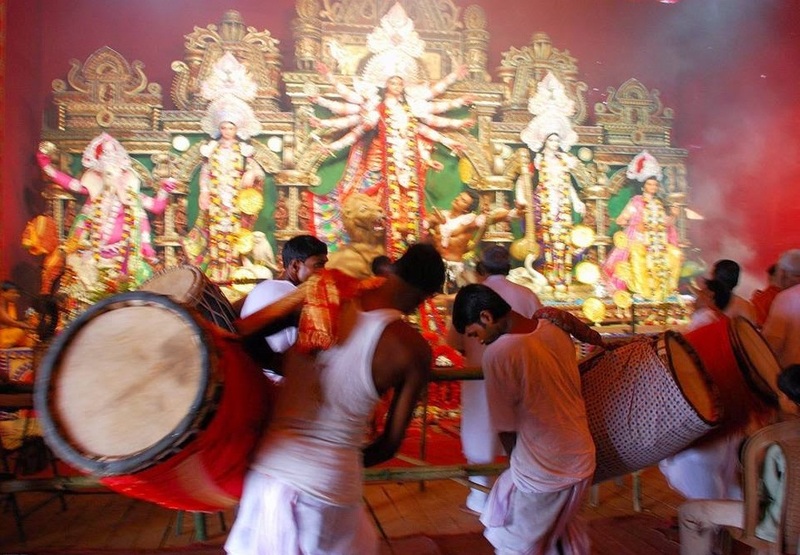 The festivities begin with enchanting of the ‘Mahalaya’ that is broadcasted on the All India Radio, that echoes across the sleepy neighborhood at daybreak to welcome the Goddess. 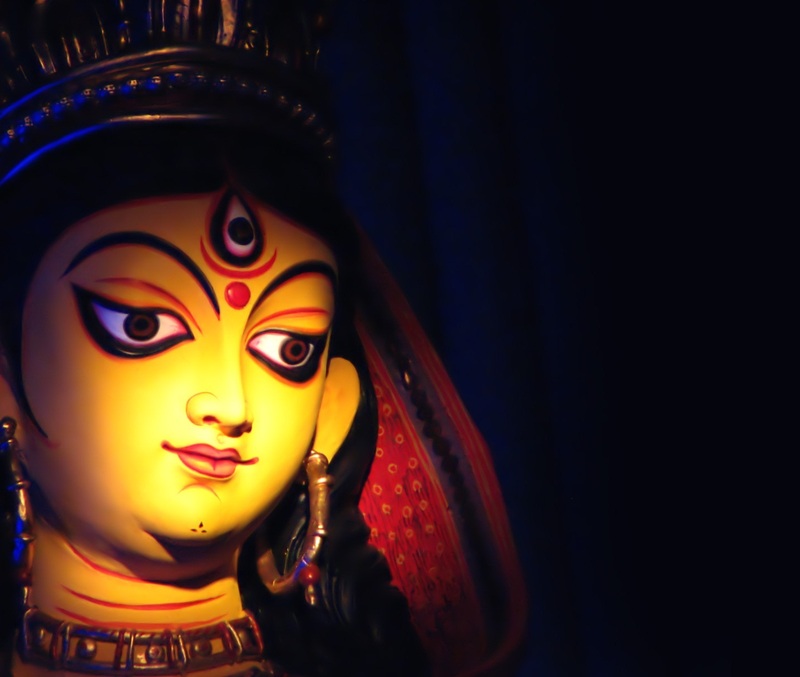 It’s a kind of invocation or invitation to the Mother Goddess to descend on Earth on the auspicious occasion that is observed seven days before the Durga Puja. While the priests recite Sanskrit prayers, men and women in their traditional attires visit the temples offering anjalis(divine offering) to worship the deity, to fulfill their wishes and stay safe, enriching the inner depth with spiritual holiness. Art and culture flourish in this 4 day festival that captures the heart of every person and the guests visiting from far and wide. The preparations of the festival start months before. 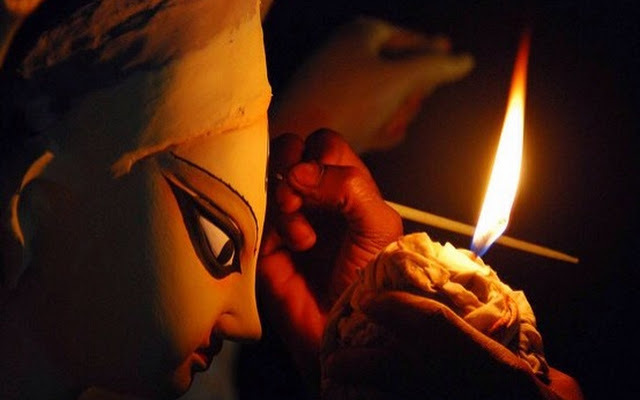 Deft fingers of the artisans give life to the elegant Durga deity at the Kumartuli Village, the traditional potters’ quarter that is one of the seven wonders in Kolkata. Here, one can smell the fresh mud and witness the making of the clay gods and goddesses and their various forms that leave a lasting impact. The idols are adorned in gorgeous ornaments, dressed up and painted. 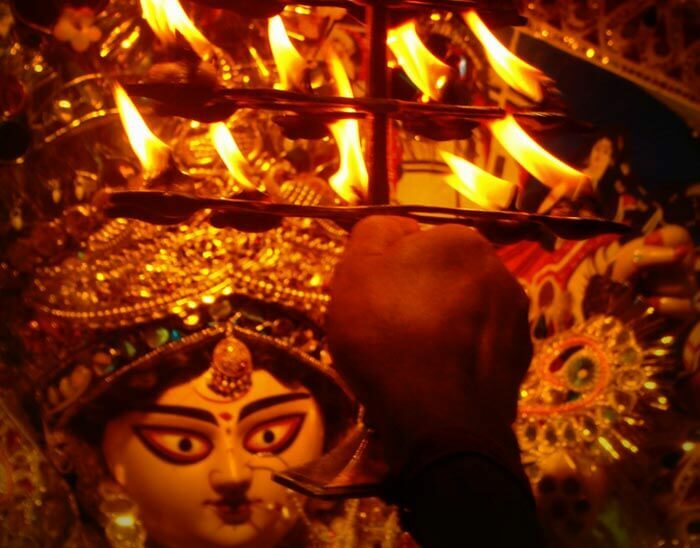 One of the oldest and most interesting phenomenon is the ‘Chokkhudaan‘ or the ‘Offering the Eye of Goddess Durga‘. The final stroke of the brush to paint the eyes of Durga. It is said that this ritual is supposed to be done in complete darkness and in the presence of only one sculptor but no one else. However, today, only a few sculptors follow this rule, as others have to finish the idol making beforehand. 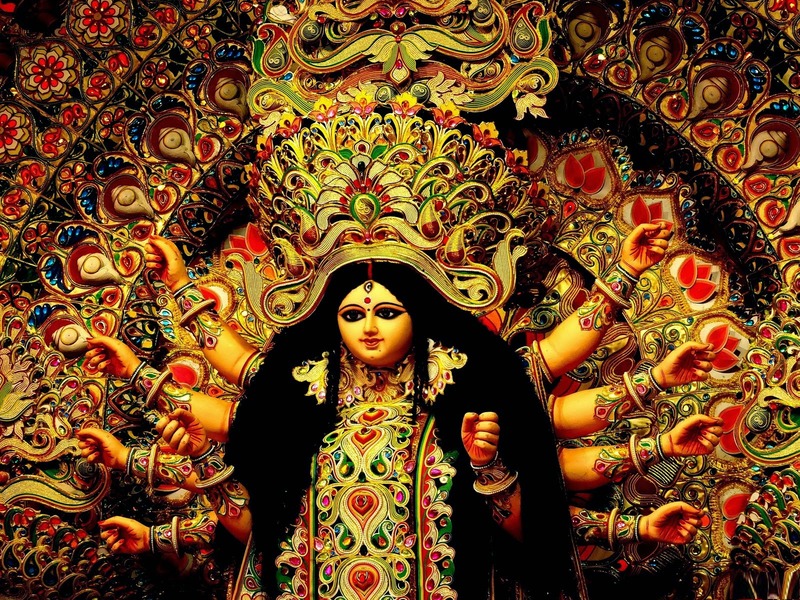 The deity carries a weapon in each of her ten hands and signifies the demolishing the evil power. Aarti with a dhunuchi (incense burner used for one of the stages during Aarti) dance is integral to the evening rituals. 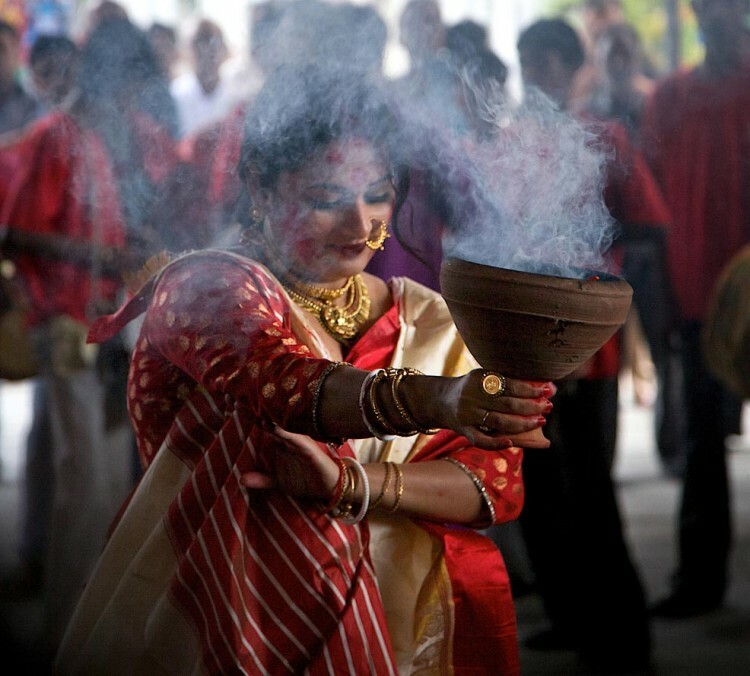 The fragrance of incense sticks fills the arena bringing a devotional fervor. On the last day of the Puja, married bengali Hindu women celebrate their sindoor (vermilion) the ceremony known as ‘Sindoor Khela’. 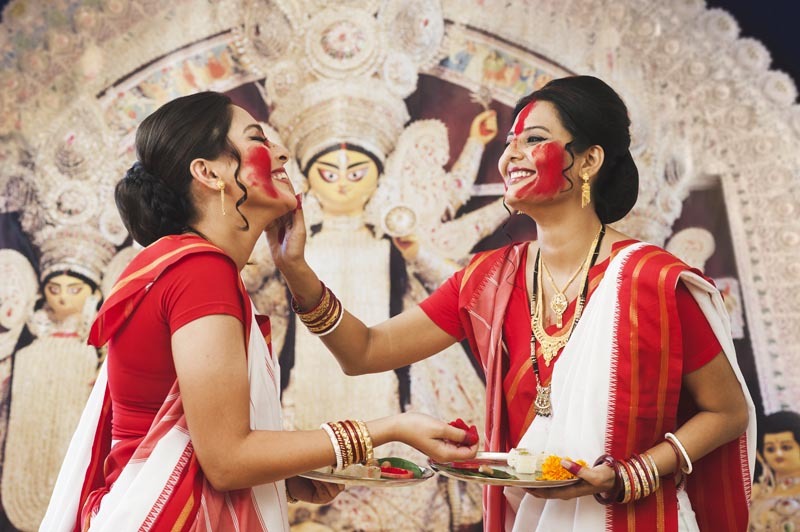 The females apply sindoor on the Goddess’s feet or forehead and later smear the red vermilion on each other, thus making it a joyous event, overcoming the sadness of farewell. Huge processions make their way through the streets of the city, the drumbeats making the houses tremble. The rhythmic recital of dhaks in harmony create an ambiance of exuberant celebration. 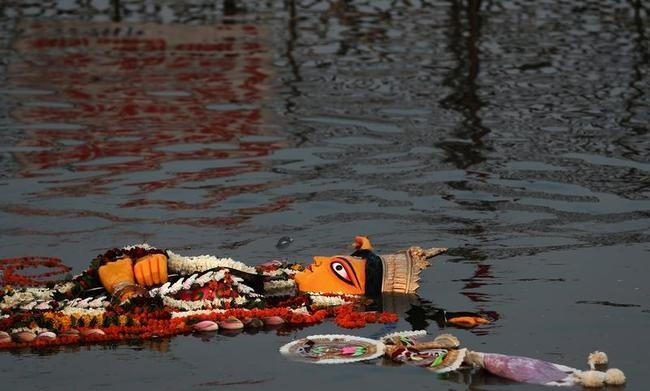 Amidst the emotional enthusiasm filled up in the air, calls of reassurance, “Aasche bochhor aabar hobe” ( Maa Durga will surely come back again next year) her divine idol is taken to the River Ganga for immersion. 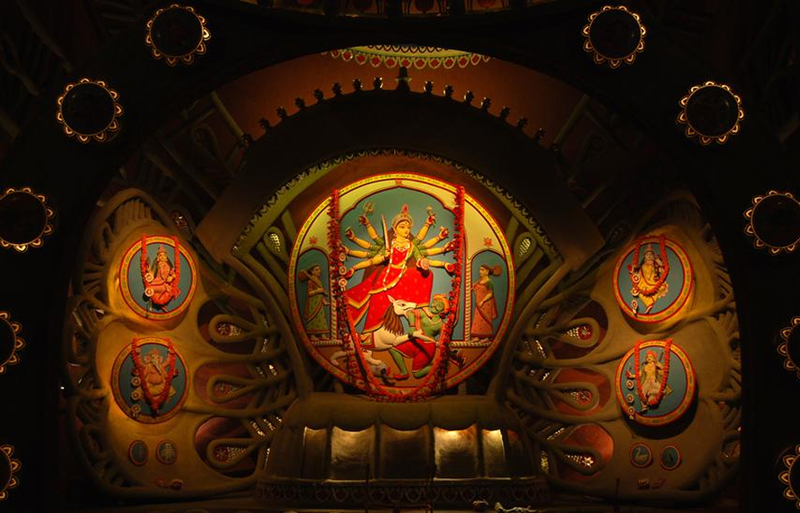 The disheartening separation of the Goddess creeps in the air of Kolkata, but the colors, merrymaking and dancing remind us to be enthusiastic and happy as the Mother Goddess shall return the next year.